Like the name already implicates that section is reserved for basic fake plug jewellery. If you are new to the plug game this is your place to be. Fake plugs are perfectly suiting for anybody that is into the style but not yet the earlobe stretching. Approved colours, designs and materials help you find your way through the piercing jungle. Whether surgical steel, horn or acrylic everything is up to you. Make a stand for cool styles independent of the size of your earlobe piercing. Sometimes it is better to have jewelry that is less special and less conspicuous. Especially when you are going to a auspicious occasion where you are planning to wear festive clothing it is often better when the main focus is not on your piercing jewelry but on your clothing. This is the moment where classic fake plugs come into play. These do not have very unique and noticable patterns and they aren´t available in crazy shapes but they are perfectly suitable to stress your festive clothing. Classic fake plugs are available in almost any colour you can think of. This makes them very versatile. You will always find a classic fake plug that matches the colour of your clothing. Classic fake tunnels are not only available in diverse colours but you can also buy them in different sizes. If you want to wear them in larger sizes nevertheless it is not neccessary to stretch your earlobe piercing. You can always wear any fake plug with a classic, unstretched earlobe piercing. The only parts of the fake tunnel jewelry that vary in size are the plates. We offer most of our classic fake plugs in 5 different sizes. These are 4mm, 6mm, 8mm, 10mm and even 12 millimeters. This way you´ll be able to decide wheather you want to wear larger or smaller fake plugs at every single day. This is a big advantage in comparison to -real- flesh tunnels. 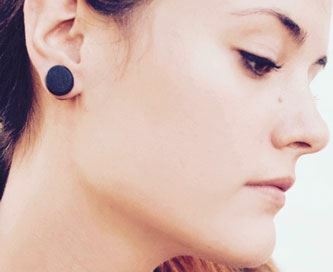 If you like to wear large plugs on one day you can always swith back to a smaller size at the other day without needing to restretch your earlobe piercing. With classic fake plugs you will be able to perfectly simulate a real flesh plug in multiple sizes while your earlobe piercing remains in the same unstretched state.